Ilminster nestles under three hills each of which have a public access to the top. The combined These walks start at the Recreation Ground and will appeal not only to walkers keen to see some of the hidden parts of Ilminster but also the whole family—even the dog! 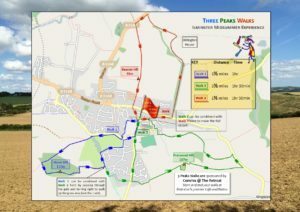 There are three separate walks which can be done individually, or all three can be linked together to produce a walk around Ilminster on public and permissive footpaths over the three high points of Herne Hill, Pretwood Hill and Beacon Hill (via Dillington House) – hence the “Three Peaks”. The only prize for completing a walk is the satisfaction of having done so. The walk is also an opportunity for local charities to raise funds with sponsored walks. Check out the Sponsorship Helpful Tips and Information page here and Sponsorship Form here. So download a map, have fun and good walking!